Christmas is right around the corner and if you’ve got a cyclist in your life that enjoys mountain biking, we’ve found the best Christmas gift ideas that will be right up their alley. While there are several mountain bikes to choose from, we’ve gathered the best Christmas gifts for cyclists this year to help you make this Christmas memorable and special for the cyclist in your life. 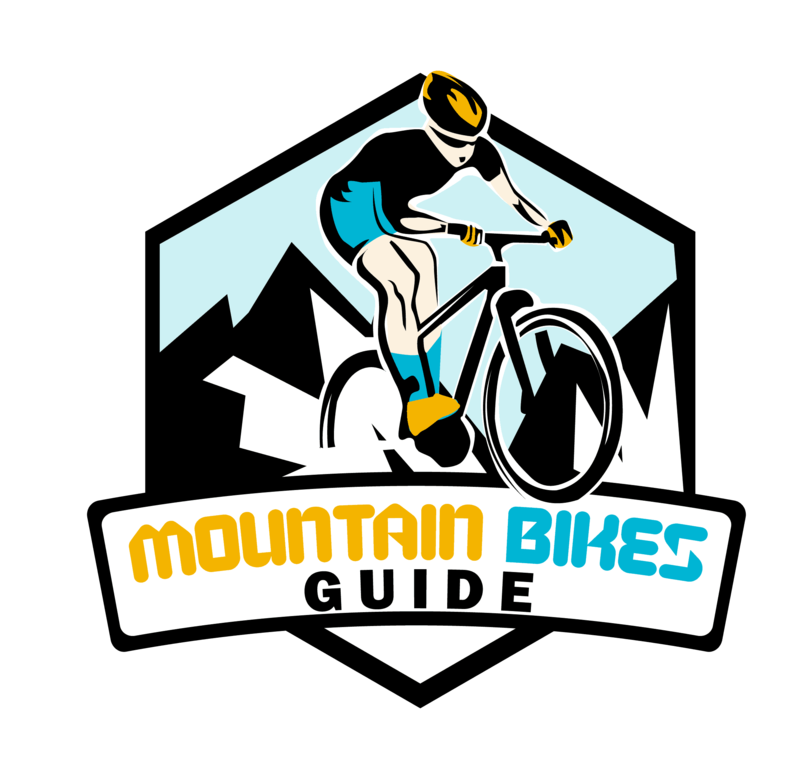 Especially if you are new to choosing a mountain bike, there are a few things you will need to know so you can make the best and most informed choice for the cyclist in your life. With a little knowledge you can be sure to make this Christmas gift a success. Not all mountain bikes are created equal. That being said, different makes and models from different brands can provide the rider a unique experience. The question is what sort of experience is your rider looking for? Whether you know the answer to that question or not, there are several different pieces and parts to become accustomed with so you can make the best choice. Downhill or Park Bikes: tougher and made for rough terrain and are bigger than other styles. Fat Bikes: made for sand or snow and great for beginners since they are more forgiving due to the wider set tires. Cross Country Bikes: great for speed and ascending since they are light and efficient. Trail Bikes: the most common style of mountain bike and generally a well-rounded bike that can handle most trails and terrains. All-Mountain Bikes: styled similarly to trail bikes, just with a little more durability for rougher terrains. Now that you know about the different styles of mountain bikes, let’s dive into the different features. The features of mountain bikes can determine the overall weight of the mountain bike and how well the mountain bike can handle terrain. Rigid: not as common among mountain bikes since rigid means that there is not suspension included. Mountain bikes that are rigid are less expensive and are easier to maintain, but there will be a loss of comfort since there will be no shock absorbed. Hardtail: Mountain bikes with hardtail suspension will have suspension forks on the front tire, but not the back. Hardtail mountain bikes are less expensive than full suspension and easier to maintain. Full Suspension: There are many different styles of full suspension that will vary from brand to brand but in general full suspension will mean that both front and rear tires will have suspension. This leads to greater shock absorbing and smoother and more comfortable riding, even on the roughest of trails. The frame of the bike is what keeps everything together, but it’s the materials the frames are made of that stand out. The material of the frame will determine the overall weight, strength, price, longevity, and most importantly, ride quality. Aluminum is the most common frame material as it is strong and less costly than others. It is durable and light which makes it common among manufacturers. There are also frames on the market made from titanium, steel, or even carbon fiber. These materials are all strong and durable, yet they do not come without a hefty price tag. Steel is stronger, but it’s heavy weight can deter beginners. Titanium is lightweight and strong, but it is only used in the ﻿﻿most expensive of mountain bike brands. In contrast, carbon steel is more commonly seen in mountain bikes due to the low weight and incredible strength, but it too is more expensive which is directly caused by the labor needed in the manufacturing process. When it comes to the number of gears on the mountain bike it can vary from single speed all the way up to thirty or more. The number of gears the bike has will be determined by the number of front chain rings that are then multiplied by the number of individual sprockets on the bikes cassette. Things can become quite complex when you begin to consider the number of teeth on the cogs and the many different combinations you can have between cogs and chain rings. To keep things simpler, when it comes to gears, the main things you want to consider would be the overall fitness of the rider and what sort of terrain they ride on. If the cyclist enjoys steep hills or a physical challenge, then more gears will suit them just fine. If however, the cyclist is quite strong and prefers a more lightweight bike, or they will only ride on flat terrains, then fewer gears will be better. It will be quite common to see mountain bikes that will come with 2 or 3 chain rings which will allow for easier climbing. However in recent years it is becoming more and more popular to see mountain bikes that have single chain rings and a cassette with up to 11 cogs. This is because the mountain bikes are still light and provide all the gears you will need with only one shifter. Disc Brakes: the most commonly seen among mountain bikes. Disc brakes will have a pad that grips the brake rotor that is mounted onto the wheel hub. There are two main varieties of disc brakes that include hydraulic and mechanical. Hydraulic brakes are easier to use and stronger. Mechanical brakes will require manual adjustments when the pads wear off. ​Disc brakes are more consistent with their braking but they are more expensive to maintain. Since they are easy to use, riders will experience less strain in their hands after long rides. Rim Brakes: Entry level mountain bikes will usually be equipped with rim brakes. Rim brakes are built with brake pads that will grip the rims to stop the bike. Now that you know what you should be keeping your eyes out for in terms of specifications and styles of mountain bikes, we’ve got the top five mountain bikes for comparison. 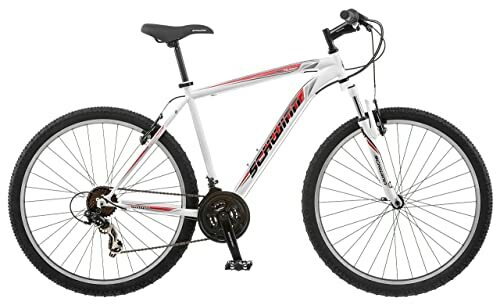 The Schwinn Protocol 1.0 Men’s Dual Suspension Mountain Bike comes equipped with 26’’ wheels. The Schwinn Protocol is a leader among mountain bikes for men due to the affordability and name brand. While the Schwinn Protocol is great for beginners, it is also a favorite among mountain bikers that like to ride on easier terrains. Tires are prone to losing pressure after long periods of time. 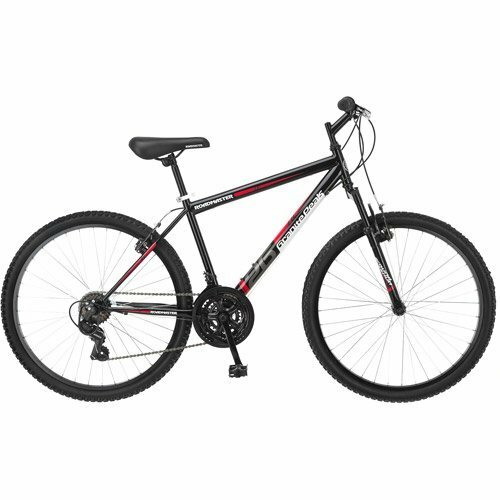 The Roadmaster Granite Peak Men’s Mountain Bike comes with a steel frame and 26’’ wheels which are suitable for most riders. An All Mountain bike, it can handle nearly any terrain you ride it on which is a great feature for beginner and experienced riders. The Merax Finiss Aluminum 21 speed is a mountain bike for men with experience on trailheads and rough terrains. While it is a great choice for intermediate riders, advanced riders also turn to the Merax Finiss for an excellent and fun ride. Very lightweight with aluminum frame and parts. 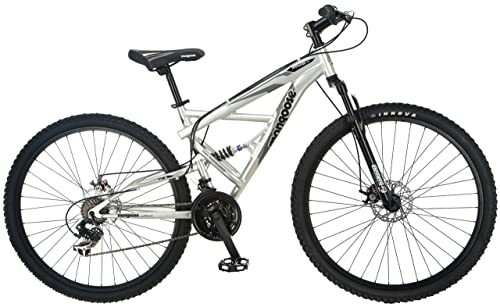 Another popular name brand among mountain bikers, the Mongoose Impasse is a taller bike at 29’’ that suits beginners and intermediate cyclists. The affordable price and multi-trail capabilities attracts cyclists to this mountain bike. The Mongoose Impasse mountain bike for men is a lightweight and durable mountain bike. Can cause confusion when assembling. May be best to take to a bike shop to assemble which will add an additional cost. Will need to adjust the disc brakes when assembly is complete. Another reason to take it to a bike shop for assembly. ​Tires can lose pressure after long periods of regular use. 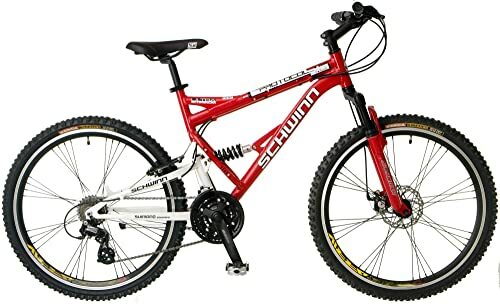 The Schwinn High Timber Men’s Mountain Bike is yet another great mountain bike from a trusted and renowned brand. The High Timber mountain bike for men is strong and durable and can tackle a variety of trails. Whether the cyclist in your life is a beginner or intermediate, they can be sure to enjoy a Schwinn High Timber this Christmas. The best gifts for mountain bikers this Christmas would of course be a shiny new mountain bike sitting under the tree. 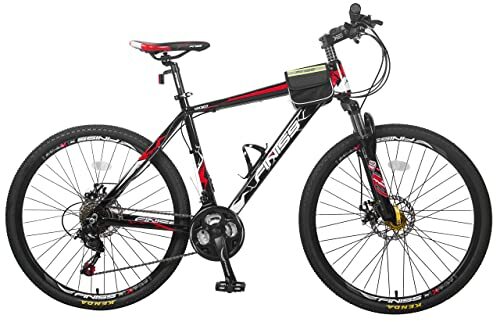 Although all of the bikes recommended are high quality mountain bikes, my personal favorite would have to be the Merax Finiss. The fact that it is an all-mountain bike that can handle a large variety of terrains gives it more versatility. Not to mention, any level of mountain biker can enjoy the Merax Finiss, especially if they have a need for speed. The Merax Finiss mountain bike for men will be durable and reliable and provide hours upon hours of trail riding. 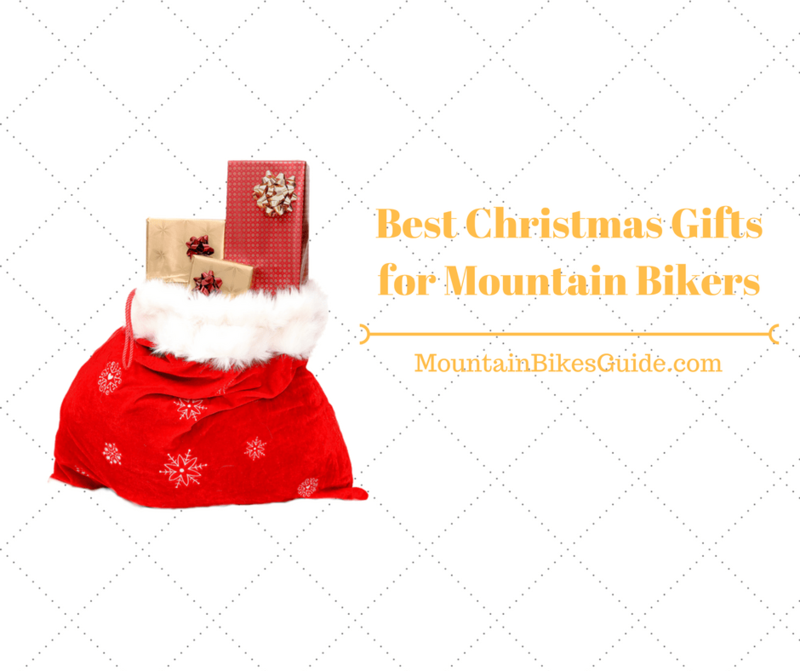 Those looking for the best gifts for mountain bikers this Christmas should definitely consider a Merax Finiss.